Aunt Pearl’s is named for Pearl Lawyer, who lived here with her family in 1928. 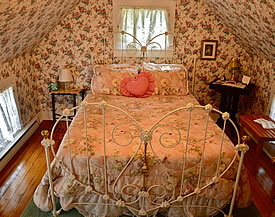 Aunt Pearl was happy and content in her cozy home, with her flowers, until 1987 when she passed away. 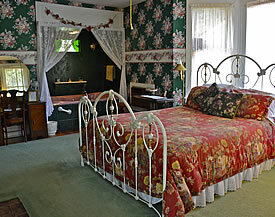 A charming cottage with an additional four guest rooms, Aunt Pearl’s is just a short walk down a lit path from Highlawn Inn. Refresh yourself with tea, coffee, and mineral water from the famous Berkeley Springs in the tiny pantry at the rear of the cottage. 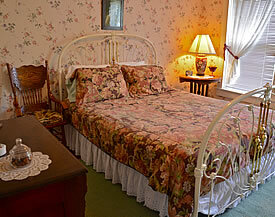 Flowers are everywhere, as they are all over Highlawn Inn, and include gardens surrounding the cottage in memory of Aunt Pearl honoring her devotion to her blossoms. 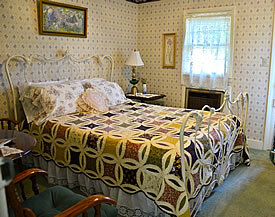 Aunt Pearl’s front porch is accessible by #3 The Parlor Room and #4 Ridge View and has a swing providing a view of a beautifully and ornately decorated summer cottage.